The blues/rock harp player's microphone. This is Shaker’s blues/rock microphone. Designed and built for the more aggressive harp player. 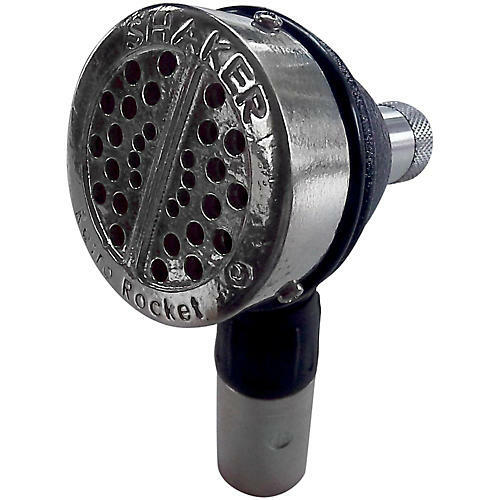 The Shaker Retro Rocket, with its hand-cast, solid pewter grille and black crinkle finish, looks like it fell out of the 1940s, classic and cool. The Shaker Retro Rocket’s heart is a large-diameter dynamic element with a frequency response range of 40 - 6,000 Hz, producing a big, fat tone with a hint of compression. The Retro Rocket mic is approximately 40% smaller than traditional bullet mics (more easily cupped for players with smaller hands). The output connection is an external Neutrik XLR unit wired PIN-2-HOT (works great in microphone clips). If you use the Shaker Retro Rocket mic with an impedance-matching transformer in the input of your amp, your Retro Rocket becomes a super-charged tone monster, driving your amp into aural overdrive. All Shaker harmonica microphones are really two very different units in one. Direct to amp has the traditional Shaker tone and response. Used with a line-matching transformer, you get high output - hot and driven. Maximum flexibility, it’s your choice. Heavy blues and rock harmonica microphone. Order today.